Greetings, forex friends! The CPI report is not the only top-tier economic report for the U.S. this week since the U.S. retail sales report is also scheduled for release on Friday (September 15, 12:30 pm GMT). And if you need to get up to speed on that as well, then I’ve got you covered since I’ve got an Event Preview for that as well. Oh, for the newbies out there, the retail sales report gives us an early glimpse at the level of consumer spending. And consumer spending, in turn, is the backbone of the U.S. economy, which is why it usually gives the Greenback a volatility injection. The total value of retail sales jumped by 0.6% month-on-month in July, which is great because that’s double the consensus forecast of +0.3%. This 0.6% jump in July is also the fastest rise in seven months and marks the second straight month of stronger headline readings. Looking at the details of the retail sales report, 10 out of the 13 retail store types reported higher retail sales, with the remaining three reporting declines in sales. Given the broad-based increase, even if sales at motor vehicles and parts dealers are exluded because of their volatility, the resulting “core” reading still printed a strong 0.5% increase, which is also still bigger than the consensus of +0.3%. Moreover, this is the strongest core reading in six months and, like the headline reading, marks the second month of improving readings. Aside from those, the year-on-year headline reading was also great since it came in at 4.2%, which is stronger than the previous 3.4% annual rise and therefore puts an end to three consecutive months of ever weaker annual readings. Overall, the July retail sales report was pretty good and was a good start for both year-on-year and quarter-on-quarter Q3 growth. And that’s why the Greenback reacted by shooting higher pretty much across the board. The FOMC minutes were scheduled for release the following day, however, so there no follow-through buying, likely because Greenback bulls were taking profits off the table. 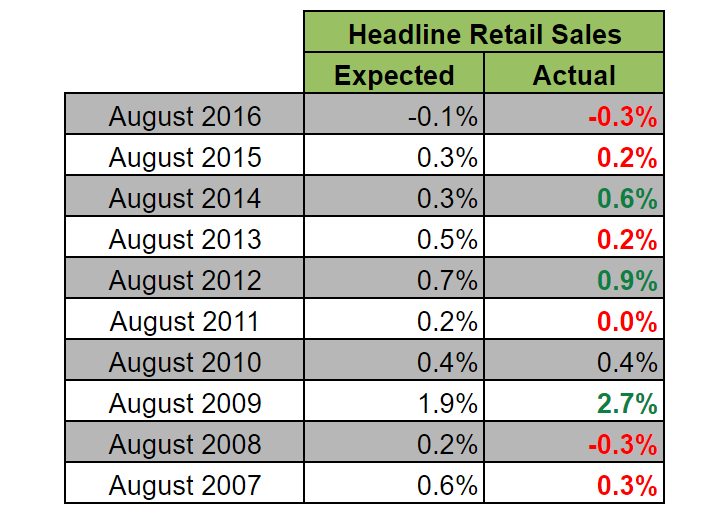 For the retail sales situation in August, most economists project that the headline reading for retail sales will print a much softer rise, increasing only by 0.1% after July’s solid 0.6 jump. However, the core reading is expected to print another robust 0.5% increase. The implied consensus, therefore is that most retail store types will continue to print strong numbers since the core reading is expected to hold steady. However, sales from motor vehicles and parts dealers will be a drag since the headline reading is expected to dip. And as mentioned earlier, sales from those store types aren’t included in the core reading. Looking at some of the available leading indicators, total vehicle sales in August climbed by an annualized rate of 16.1 million, which is less than the previous reading of 16.7 million. It’s also the smallest increase since April 2014, which supports the consensus for a slower headline reading. Markit’s services PMI report didn’t really talk about the retail trade industry, so we can’t corroborate ISM’s findings. However, Markit’s manufacturing PMI report indirectly did when it noted that there were “encouraging signs of improved domestic demand” for consumer goods. Moving on, the August NFP report was disappointing because jobs growth slowed (+156K vs. 189K previous). But more importantly, wage growth slowed as well since average hourly earnings only increased by 0.11% month-on-month in August after the 0.34% increase in July. And this could could potentially translate to weaker consumer spending. Despite the poor wage growth in August, CB’s consumer confidence index jumped from 120.0 tp 122.9 in August. Although it remains to be seen if higher consumer confidence translated into stronger consumer spending. As for historical tendencies, the headline reading has historically more downside surprises compared to upside surprises, which slightly skews probability in favor of another downside surprise. The core reading, meanwhile, has no strong historical tendencies, with the same number of upside and downside surprises in the last 10 years. Also, the headline July reading has also been getting upgrades in the past four years, although it remains to be seen if that pattern will stick. The core July reading, meanwhile, has no clear historical tendencies or patterns when it comes to revisions. Overall, the leading indicators, with the exception of the poor wage growth in August, are pointing to another strong showing for the retail trade industry, which is in-line with expectations that the core reading will print another solid 0.5% increase. However, vehicle sales slowed in August, which is also in-line with expectations that the headline retail sales reading will be weaker. As for historical tendencies, they’re not as clear-cut, but there does seem to be more downside surprises for the headline reading in August, although there have also been upside revisions for the July reading that somehow makes up for it. There’s no guarantee that the pattern will stick, though, especially since the leading indicators are pointing to another overall strong performance in the retail trade industry. And that means that it’s possible that the other retail store types would be able to offset the weakness in vehicles sales. As for the core reading, it’s a bit of a coin toss since there are no historical tendencies or patterns when it comes to revisions to the July reading, as well as how economists fared with their guesstimates for the August reading. Anyhow, just remember that if expectations are beaten, then that’s generally seen as good for the Greenback. 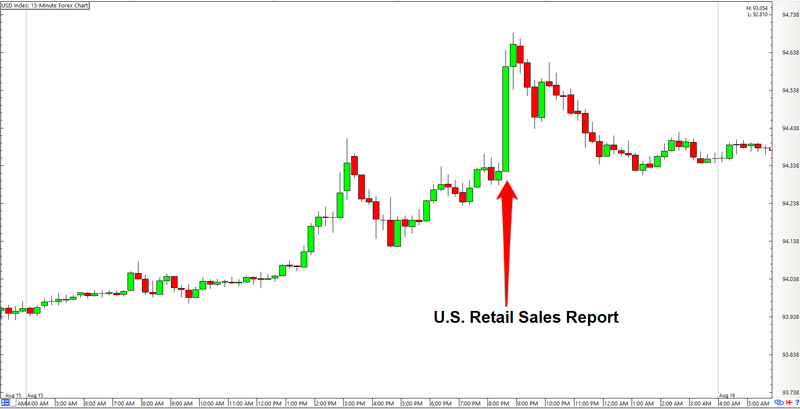 And last month’s bullish reaction to the July Retail Sales report is an example of that. But on the flipside, misses are generally frowned upon by Greenback bulls. And if the headline and core readings are mixed, then the headline reading is usually viewed as more importance because of its direct impact on GDP, although the details of the retail sales report is usually taken into account as well.